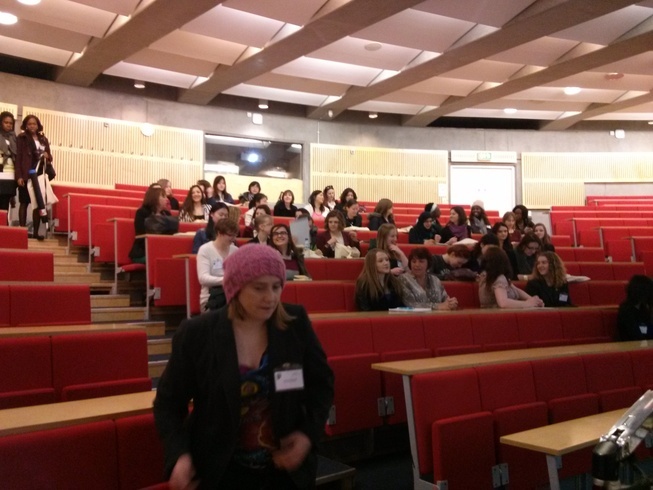 The sixth BCSWomen Lovelace Colloquium was held at the University of Nottingham, on the 4th April 2013. I can hardly believe that we’re already on number 6! The day featured talks from industry and from academia, a panel session on careers, a poster session of student work, a social, and of course lots of time for networking. We had more talks than usual this year, as the original schedule featured a 1h keynote, but our speaker had to pull out due to family reasons. So Joolz & Gillian stepped in at short notice to do a short talk each, which were both great. This meant the program was really very packed indeed, but I quite like that – if the main complaint on the feedback forms is that there was too much interesting stuff going on, I think we’re doing something right! Julie Greensmith (also the host!) spoke about artificial immune systems (AIS), and how interdisciplinary work can really pay benefits if you do it properly. Julie came up with the Dendritic Cell Algorithm in AIS; now loads of other people are researching that too. Go Joolz! The last talk before lunch was Gillian Arnold, BCSWomen chair. She spoke about the way tech careers can be really rewarding; she’d asked around her contacts for “the best moment in your career so far”, which ranged from earning LOADS of cash, to getting an MBE, to helping out in developing countries… there are loads of different ways to have an excellent career in tech. After lunch, I spoke about my research into computer vision for plant imaging. I’ve never spoken about my own research at the Lovelace before, as I’m the chair… but as I’d invited Joolz to speak when I ran the Lovelace in Leeds in 2009 she returned the favour and invited me back this year. It was super exciting to be on stage as a researcher as well as in my capacity as a women in computing activist. This year the poster contest was amazingly strong. A lot of the sponsors helped get involved this year, too, which was great – Google speaker Milena Nikolic helped judge the best first year contest, EMC staff helped judge best final year, and Madeleine Field from FDM helped judge the MSc student prize. I’m particularly pleased by this – it gives me a real boost seeing actual recruiters from industry not only supporting the event with sponsorship (which is in itself great), but also engaging with the students and their work. It also confirms what I’ve thought for a few years now – the poster contest standard is amazing: discussing it afterwards with the industrial contacts, they were as impressed as I was with the work. Not just the work, too – students stand by their posters and chat with judges as part of the session, and it’s super impressive meeting so many knowledgeable and eloquent young women who are into computing and technology. If these women are the future of technology, we’re in safe hands! The day finished off with a social in the Computer Science Atrium in Nottingham. The social was sponsored by CA Technologies; CA had been with us all day in the employer zone (just by the food) and generally networking with attendees. As people relaxed after the hectic day with a well-deserved glass of wine or juice (and cake, we have to have cake) the atmosphere began to calm down, CA reps chatted with students about their career plans, people got together to take photographs with new friends and old, and Joolz & I agreed it was an most excellent Lovelace. 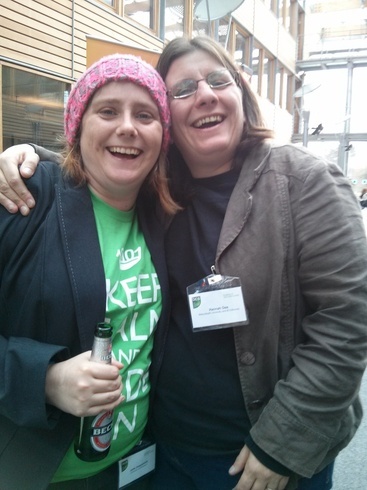 Dr Joolz & Dr Dee, local chair, speaker, chair and speaker (yes we both spoke) agreeing that it was a most excellent Lovelace whilst grinning like loons. Firstly, without the generous input from Google, who sponsored a student prize and student travel (we pay the fares and if necessary accommodation of all presenting students) we’d not be able to run the event: they’ve been great, sponsoring every colloquium since the first and sending a speaker every year too. Prize sponsors this year were FDM, EMC, The HEA, and Interface3. Our speakers were all fab (even me:-). Natasha Alechina, Jemma Chambers from CISCO, Gillian Arnold of BCSWomen and Tectre, Julie Greensmith, and Milena Nikolic from Google. Milena Radenkovic from Notts kindly helped keep us all to time and managed the questions. And finally we had an absolutely brilliant local team this year. Dr Joolz aka Julie Greensmith was our local chair, and she not only helped with lineup, organisation, and just about everything else… she also stepped up to give a talk too at short notice. Thank you Dr Joolz! Dipa Patel was an administrative and organisational superhero, and Maryam Marchenko went above and beyond the call of duty in helping out with all aspects of the day, from stuffing bags to dealing with tesco deliveries of booze for the social.